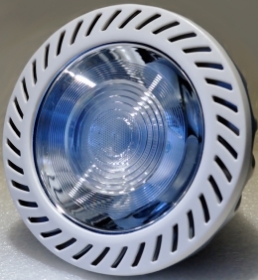 Replaces a 90W Halogen PAR 38, based on Energy Star requirements for integral LED lamps. Ultra lightweight for steadiness in any track light or gimbal fixture. Next generation design utilizing a COB single LED source and unique optics to provide a true light replacement with minimal sideways glare. Awaken uses a COB LED single light source, with unique optics and electronics to offer a true PAR replacement with efficacy and performance superior to multi source LED lamps. Unlike Halogen, Ceramic Metal Halide (CMH) and other LEDs, Awaken’s micro-structure lens minimizes sideways glare, so shoppers will stay longer and staff will be more comfortable. The Color Rendering Index (CRI) states how ‘real’ colors appear. Energy Star requires LEDs have a minimum of 80 - most are 82, Halogen is 100 and CMH is 87. Awaken’s LED PAR38 is 83. Awaken focuses on the Center Beam Intensity (CBCP) required by Energy Star to be able to claim equivalence with Halogen, rather than total light (Lumens) - which includes stray light (glare). Lamp stays cool to the touch. Awaken’s thermal management creates airflow in the fixture to keep the lamp cool for long life. Awaken’s unique optics,electronics and reflector technologies combine to produce a LED array lamp - the result is an exponential Halogen replacement with Punch, from Narrow Spot lights for very dramatic effect, without any sacrifice of brightness to wide angle beams.